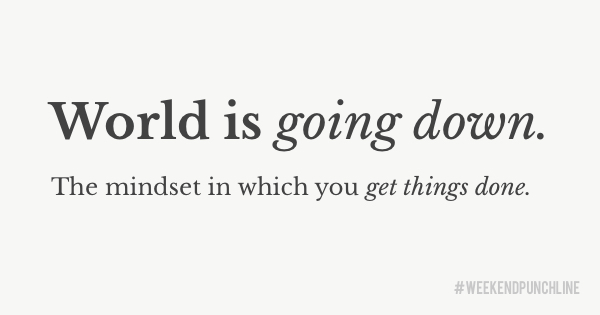 The mindset in which you get things done. When things are falling apart, your relationship failed and you are broke with no money on your bank account, that is when you start doing. Get broken because you regret. This is one option too much. You still have a choice which is bad for you because in your state of mind you would choose the easy way out: Standing there crying and not moving forward is what you do when you do not understand that a lost game is only a postponed win in the long run. Eliminate the 2nd option so it is obvious for you what to do. No thinking, no pondering, no „what if…“, only „if…“. Let me help you. You are still able to make a decision and in this moment you would choose to be a regretter. Allowing the pain, having those tears (wet or dry) and feeling bad is fine — for a certain amount of time. Life is about not always being happy in every single moment of your life. Life is about the struggle of pushing through when you are not good. If a bad moment is a valley and a good moment is a mountain, then you need two good moments so you can cross the valley on a bridge. The hard part is building the actual bridge — your job. The only way to build it is to be in the valley — your job as well. No bridge with no valley, no bridge without you. Over time, with more life experience, you will encounter more valleys and build more bridges. You can even revisit „old valleys“ and cross old bridges on your Saturday evenings having a drink and reflecting on life. That is fine. Do that. But do not do that all the time because you will remember old pains that will not serve you well when you are currently in regret mode. Thinking about old valleys in a regret mindset is twice the pain. Unless you are self-destructive, masochistic and enjoy doing that for personal reasons, I recommend now you do not. There is no way a future valley has a bridge already (except when time-traveling). You have to fill the gap of your past good moment with your future good moment. Hence, the bridge. For every single valley, you will need to build a bridge. Every time. Always from scratch. Here is the good news: With every bridge built you will become better at your craft. You will be a natural bridge-builder. This has huge consequences. If you have the capacity, skills, and willingness to push through your own valleys then you can build bridges for other people, help them in their lives, giving them your hand and even build bridges between peers that have been skeptical about one another. Imagine how your successful bridge-building has a substantial impact on your own life resulting in fundamental shifts in other people’s lives — only because you started getting out of your misery and built. When you will encounter your next valley, you will smile, with a lifted head, an oxygen-powered chest and two hands willing to build. Do you see the sunrise? Yes? Me, too. It is because you just got out of your misery. You reached the top of the valley which is the beginning of the mountain and you finished building the bridge. You came from a mindset where the end of the world had come and you found your way out. If you need help getting into a mindset where you start doing, consider the end of the world at your footsteps. Imagine the valley, where you liked to escape to (to regret), was opening up its skin and wanted to merge your bones with its lava blood. 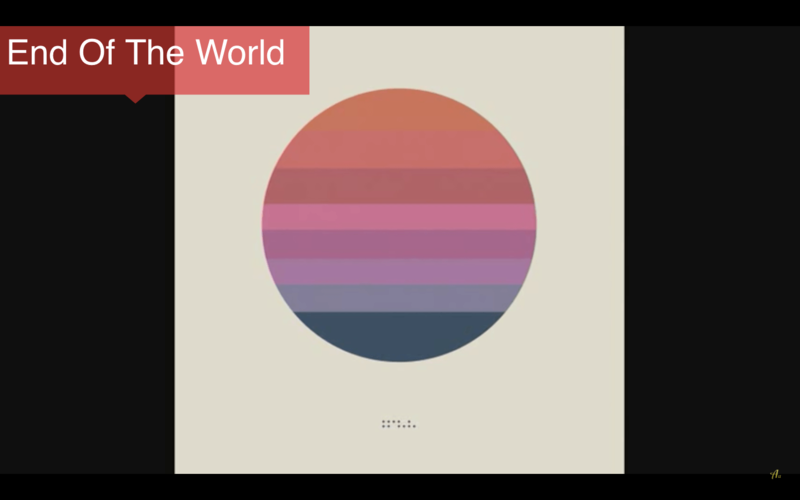 Tycho’s album „Awake“ does a great job of putting me into the mindset that the world is going down. Sadness, madness, and darkness arrive. This is the setting, scenario, and mindset in which I create and do not procrastinate. That is why autumn and winter in Germany are perfect for to work since they are dark, gray and cold. The world is going down at your footsteps. This was episode 31 of the #weekendpunchline . Every Saturday and Sunday.